The California Native Americans lived in the Californian Central Valley area, between the Pacific coast and the Sierra Nevada. Learn about the life of the people of the California Native Americans. Discover facts and information about the natural resources available, the languages, culture, clothing, their religion, beliefs and ceremonies. Pictures and images illustrating the California Native Americans culture. The climate, land and natural resources that were available to the Indian tribes resulted in the adoption of the culture shared by the California Native Americans. 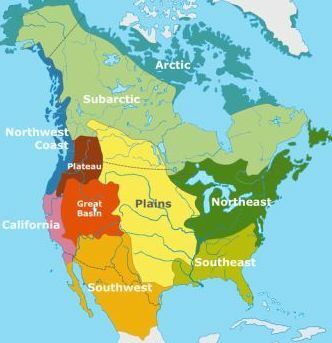 This section on the California Native Americans group provides facts and information about their languages, the temperate Geography and Environment. The hospitable, mild climate of California was home to over 100 different tribes including the Shasta, Maidu, Miwok, Mohave, Pomo, Chumash and Serrano people whose languages included the Athapaskan, Penutian and Uto-Aztecan dialects. The animals and the Plants, Trees and Crops provided their food, clothing, shelter and decorations. Their Houses, Shelters and Homes depended on their location, the materials available to them and whether the home was permanent or temporary. Many groups of related families formed villages. There are also facts and info about the Religion, Ceremonies and Beliefs of the California Native Americans group. Famous Tribes of California Native Americans: Chumash, Shasta, Maidu, Miwok, Mojave, Wappo, Pomo, and Serrano. The Native Indians who lived on the borders of lands often reflected two different types of lifestyles. 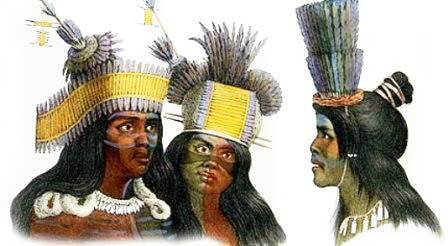 The physical characteristics of California Indians are dark brown eyes, dark skin color, prominent cheek bones, straight black hair, and scantiness of beard. The Natural Resources of California include Redwood forests, Cedar and Oak Trees, buckeye, mushrooms, roots, acorns, nuts and grasses, seaweed. Salt was a valuable trading commodity which was gathered from mineral deposits, seaweed, grass and saline water. Acorns were a staple part of the diet of the California Native Americans and were harvested and made into cakes or gruel called 'weewish'. The Religion, Ceremonies and Beliefs of the California Native Americans were based on Animism. Animism was a commonly shared doctrine, or belief, of the indigenous people of North America and Canada including the California Indian tribes. Animism is based on the spiritual or religious idea that the universe and all natural objects have souls or spirits. In this religion it is believed that souls or spirits exist not only in humans but also in animals, plants, trees, rocks etc. This belief is also extended to natural phenomena such as thunder storms and rain and geographic features such as mountains, caves or rivers also possess souls or spirits. The celebrated acorn harvest and the arrival of the first salmon. Ceremonies included those for initiations and mourning. Tricksters feature in the legends and mythology of the Californian peoples as do heroic figures or "transformers" who transform, or change, the world into its present state. The people also have their own creation myths. Tribes included the Chumash, Maidu, Mojave, Miwok, Pomo, Serrano, Shasta, Wappo, Wintun, Yana, Yuma. 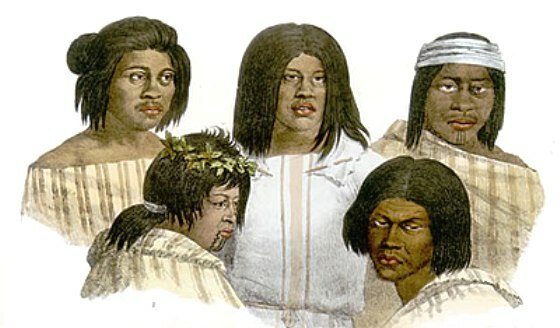 Chilula, Cocopah, Hoopa (aka Hupa), Juaneno, Karok, Kato, Wintu and Wiyot and Yurok. Discover facts about each of the following Californian Indian Tribes. The Geography and Environment can be generally described as a mild temperate climate. The California Native Americans! Discover the vast selection of pictures and videos of California Native Americans. The pictures show the clothing, weapons and decorations of various California Native Americans that can be used as a really useful educational resource for kids and children of all ages. Our series of videos enable fast access to the images, pics, paintings and pictures together with information and many facts. We hope that this article on California Native Americans will assist in your studies or homework and that you will enjoy watching the videos featuring many pictures of the California Native Americans. A great educational resource for kids on the subject of California Native Americans.